Documenting faculty qualification can seem overwhelming. 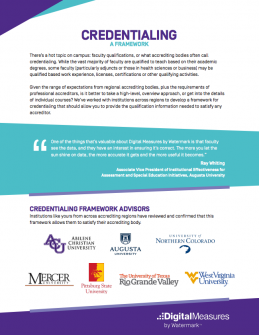 We’ve worked with institutions across the country to develop a framework for credentialing (PDF) that will allow you to provide the qualification information needed to satisfy any accreditor. As the leader in faculty activity reporting, Digital Measures by Watermark enables faculty to more easily document their teaching, research, and service activities—while simplifying inefficient reporting processes for administrators. Digital Measures enables the average institution to save 3,498 hours each year in time spent reporting faculty activities.